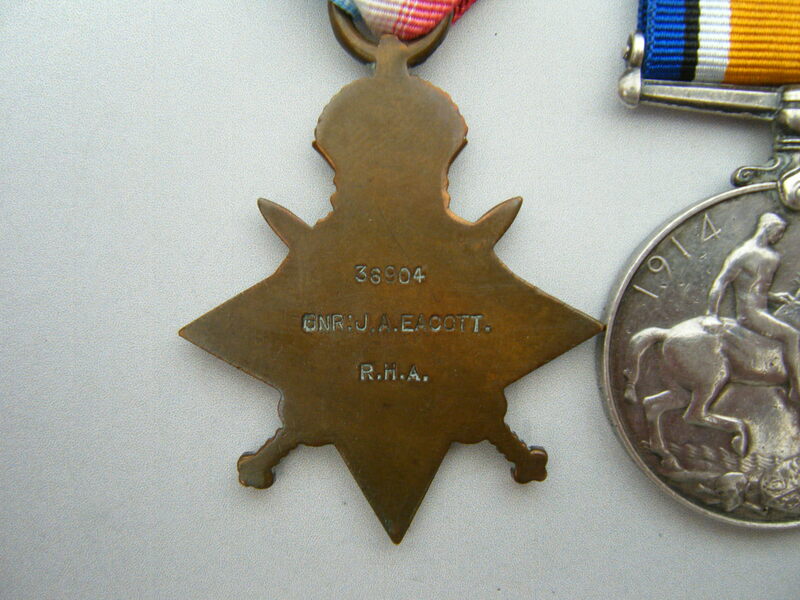 WW1 medal group awarded to 36904 Gunner (later Bombadier) Joseph Eacott - Royal Horse Artillery. Eacott joined the 3rd Brigade R.H.A. (as confirmed on the Medal Index Card) and served as a gunner (later Bombardier) arriving in France on the 15/08/14. His unit moved towards Mons from the 21st August and was present at the Battle of Mons (23rd - 24th August 1914) and was subsequently involved in the actions during the retreat. Afterwards the unit was engaged at: the 1st and 2nd Ypres, Arras, Amiens, Cambria (including the tank attack) and both the 1st and the 2nd Somme to name just a few. ‘E’ Battery the 3rd Brigade R.H.A. has the credit for firing the first British shell on the Western Front, the unit history can be viewed by clicking on here. 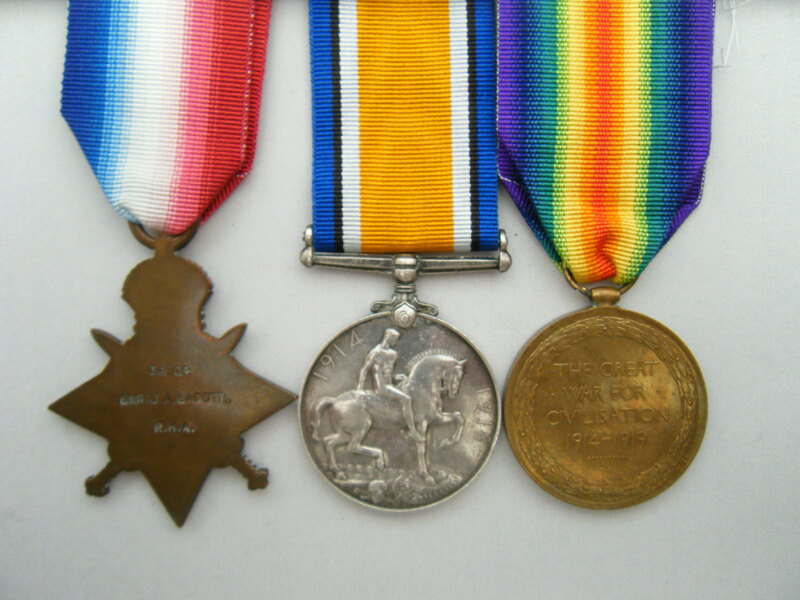 1914 Star (with Mons clasp) named to 36904 GNR J. A. EACOTT, R.H.A. British War Medal and Victory Medal named to 36904 A.BMBR, J. A. EACOTT, R.A. 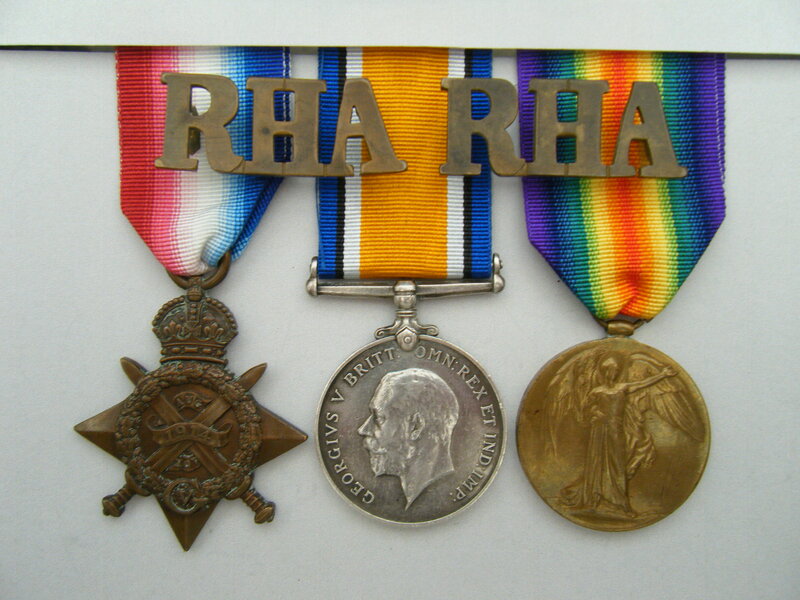 The medals are provided loose with a set of replacement ribbons, and this listing includes a set of R.H.A shoulder badges. Also included with this listing is a printed copy of the Medal Index Card which can also be viewed by clicking on here (if you have access to Ancestry). Whilst his Medal Index Card confirms his entry date into France, and this entry date is eligible for the criteria for ‘clasp and roses’, they are not mentioned as been issued on the MIC. There are a number of Eacott named service record documents available on line (one other in the R.H.A. ), but I have been unable to identify one relating to this man.